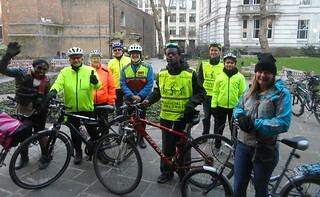 Riders: Patrik, Mary, Chris, Joy, Phil, Steven, Anna-Frederique, Essenine, Morton, Oliver and Alison. Distance: 13.28 miles 21.37 km (or 22.13 miles 35.6 km if you started at Sidings). We were well wrapped up as the day started chilly but bright. 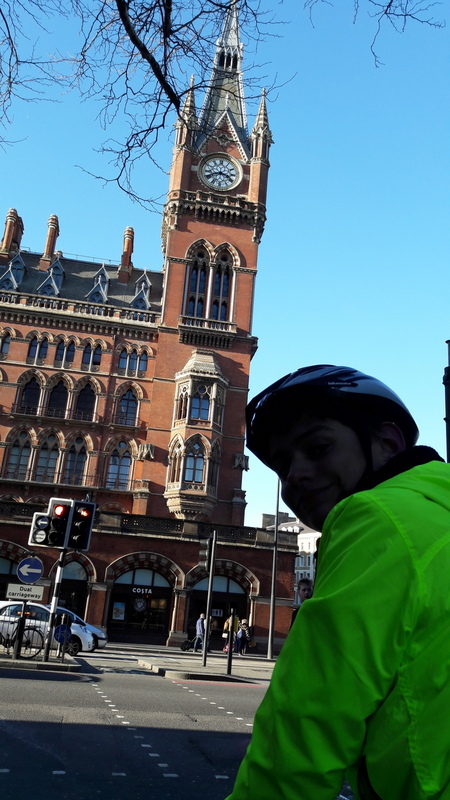 Morten and Oliver joined me for the ride from Sidings down to the German Gymnasium next to St Pancras Station where we met the rest of the party including our leader for the main part of the ride, Charles Harvey. 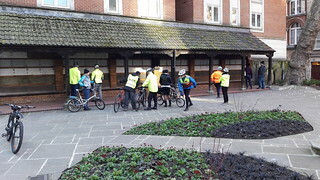 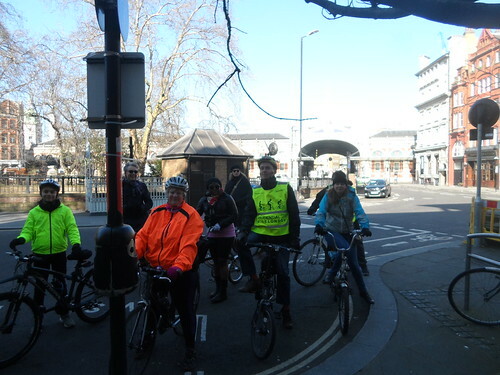 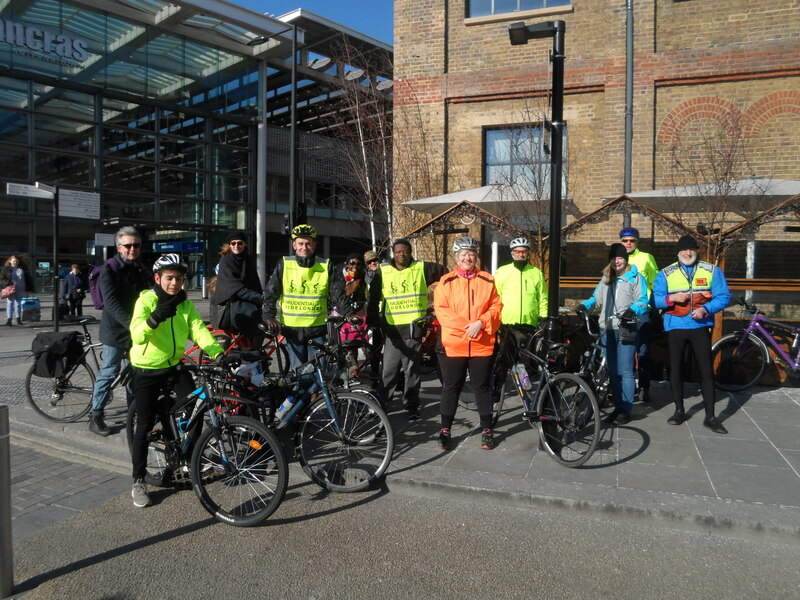 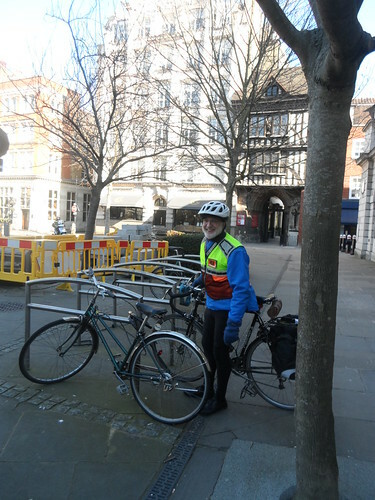 Charles always like to do a comprehensive briefing ensuring we don’t leave any riders behind and warning us that the first part of the ride was a twisty route through the back streets south of Euston Road and down towards the city via Smithfield. It was at Smithfield we made our first historical stop behind St Bartholemews Church and Hospital. 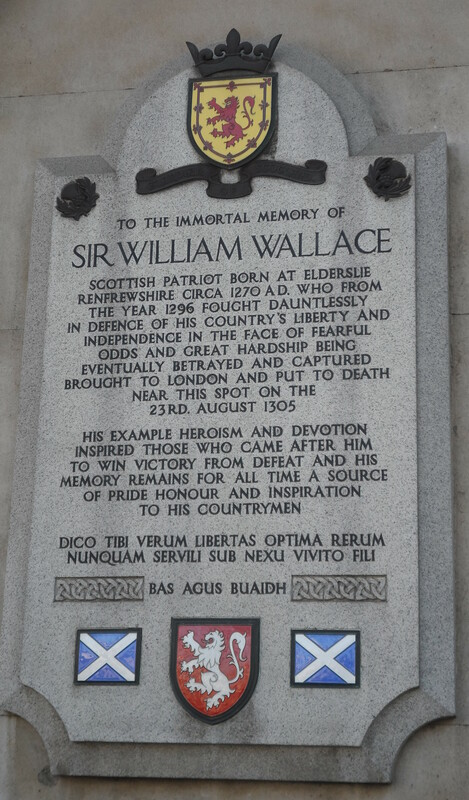 The Wallace Memorial commemorates William Wallace, popularised in Mel Gibson’s ‘Braveheart’ film, who was executed here in 1305. 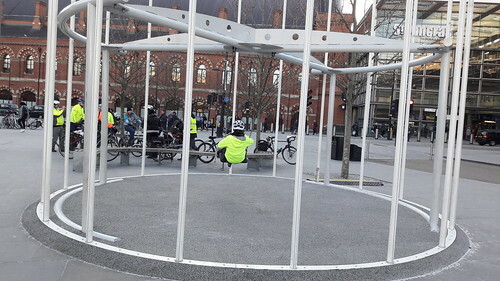 The Elms, Smithfield was for centuries in medieval times used as an execution site. 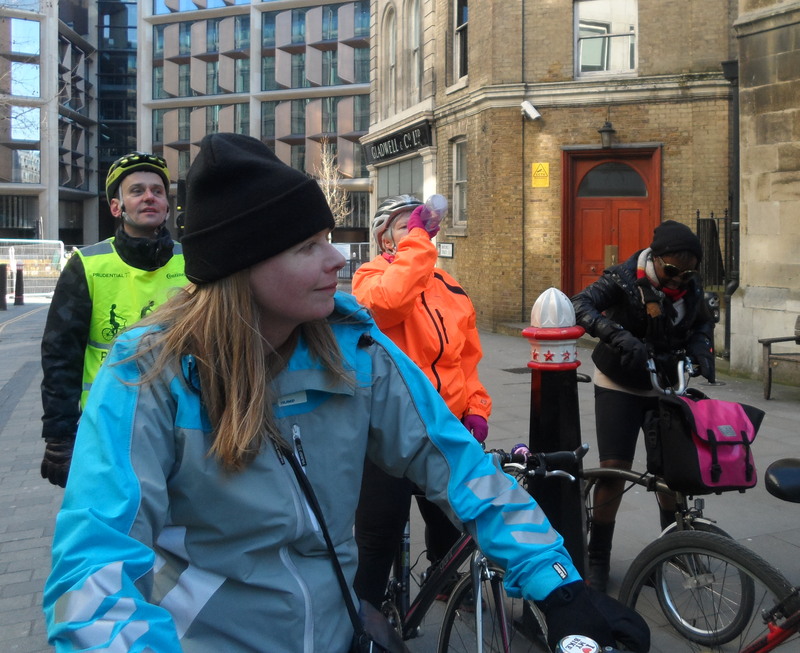 Continuing south through more twisty back routes to Upper Thames Street where there is a protected cycle lane, Cycle Superhighway 3 (CS3), taking us all the way to and around the Tower of London and into Royal Mint Street and Cable Street. 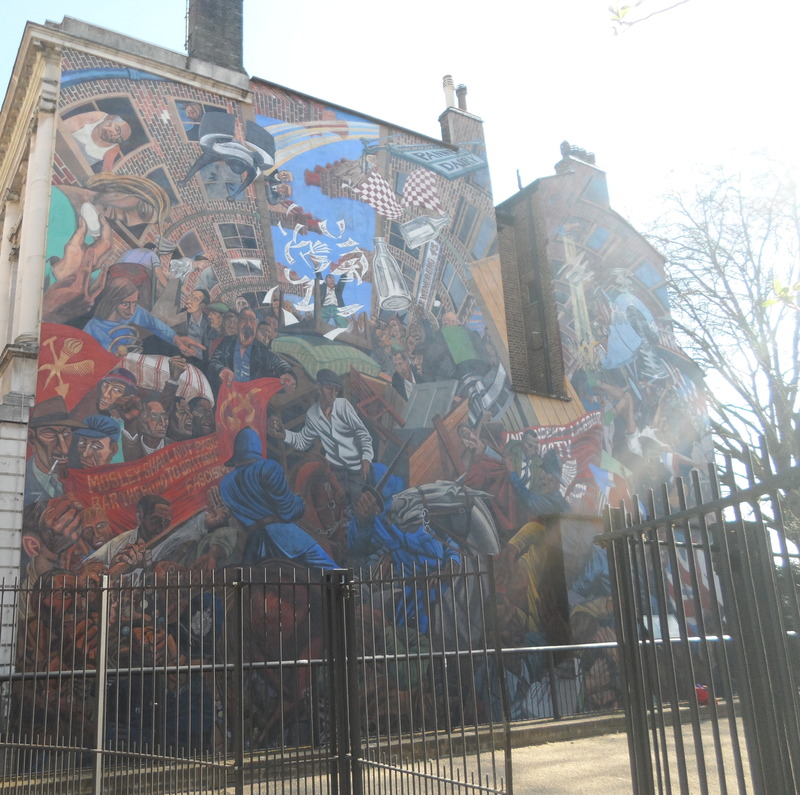 Here we stopped to observe the Cable Street mural. 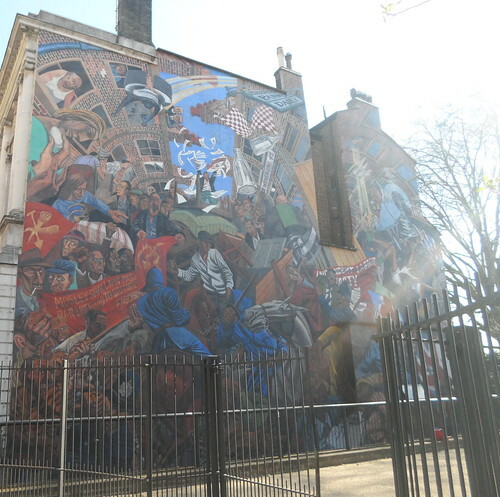 This massive mural remembers ‘The Battle of Cable Street’ when the people of the East End protested against and halted a march by Fascists, led by Oswald Mosley in 1936. 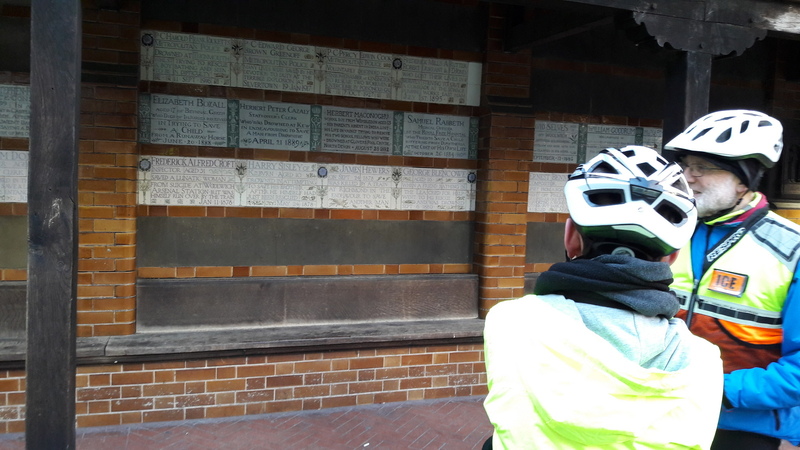 A little further along Cable Street, in Shadwell, we came upon a Blue Plaque honouring the chemist Sir William Henry Perkin. 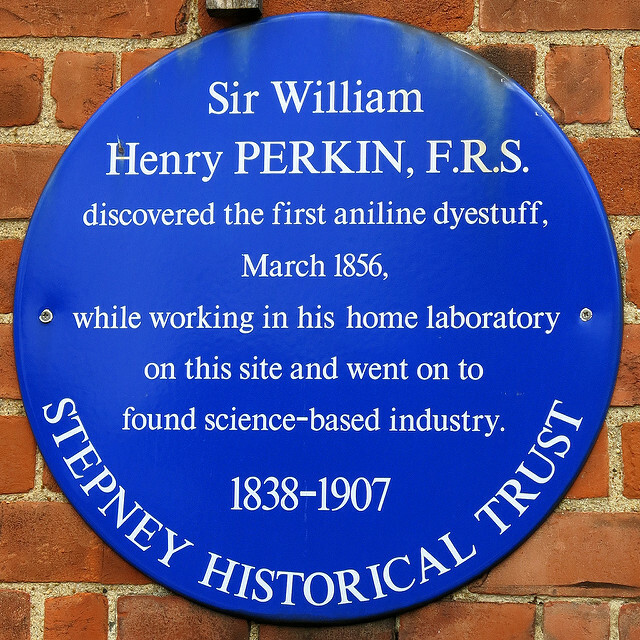 Perkin was working on developing a synthetic alternative to quinine to combat malaria. 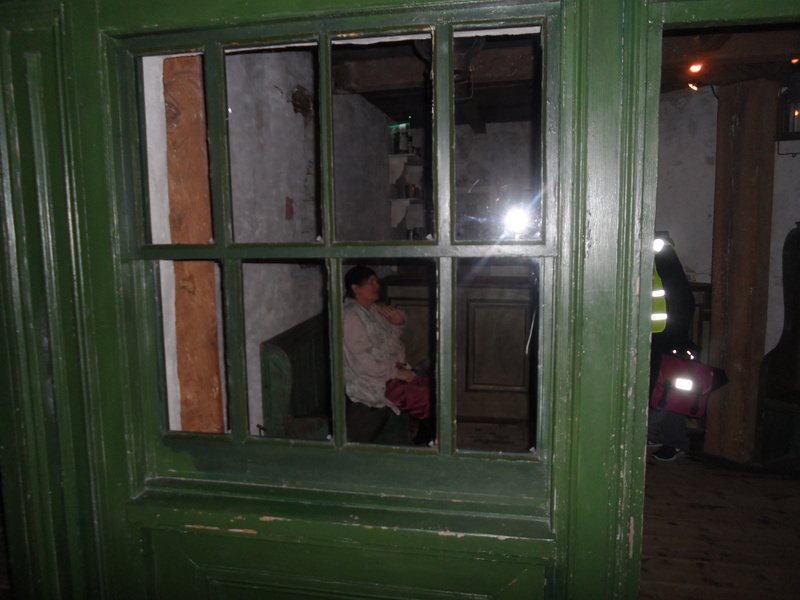 While working he spilled ome of the substance on his lab coat which turned a purple colour. 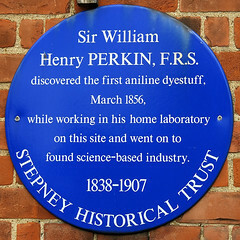 No amount of washing could remove the stain but eventually Perkin realised he had invented/discovered the analine dyeing process. 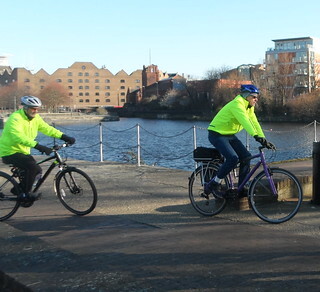 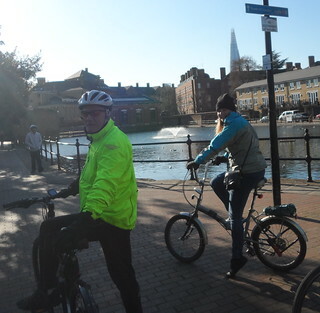 CS3 steadily took us eastward, through St James’ Gardens, across the Limehouse Link and down to the riverside, crossing the point where the Regents Canal meets the river. Just past here we made a slight diversion to observe the spire of St Anne’s Church which was an opportunity for Charles to tell us about the architect, Nicholas Hawksmoore, and advertise another ride where riders visit several Hawksmoore churches in London. 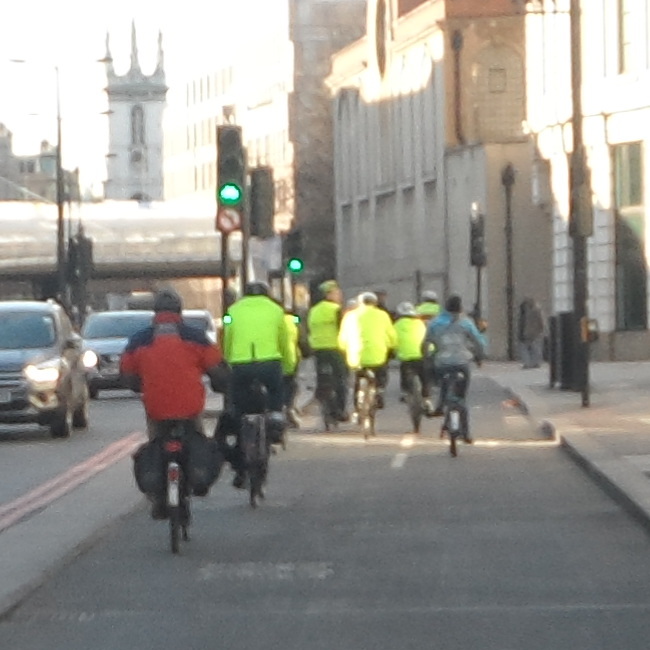 Again CS3 took us safely over some of the busiest roads bringing traffic onto the Isle of Dogs, now one of the major business areas in London. 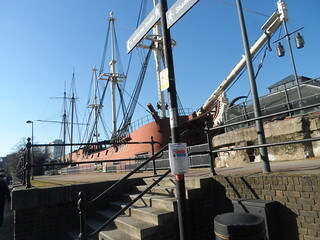 Only a short distance further we could see the back of the Docklands Museum, formerly a warehouse beside the West India Docks. 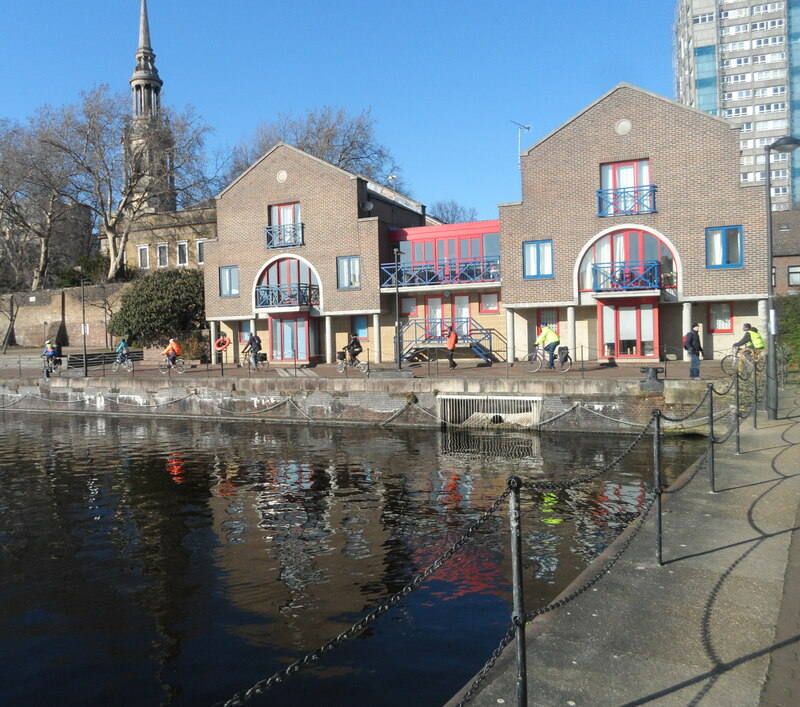 Just a couple of buildings away from the museum is a Wetherspoons pub where many of us had lunch. 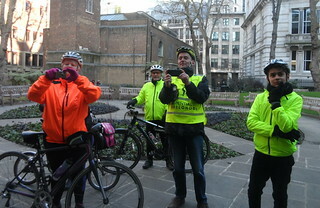 Charles informed us that there was a talk at the museum at 1pm so we finished up and gathered ready for the presentation. 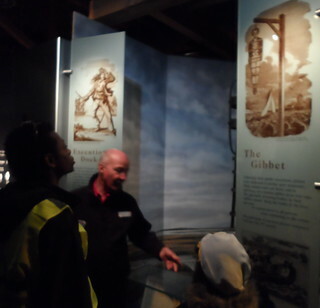 The talk was about gibbeting, the practice of hanging criminals: pirates, murderers and thieves; then enclosing the bodies in a metal cage and left to rot, hanging from a gibbet in the river to act as a deterrent to others contemplating a life of crime. The guide spoke about the origins of expressions such as ‘who rattled your cage?’. 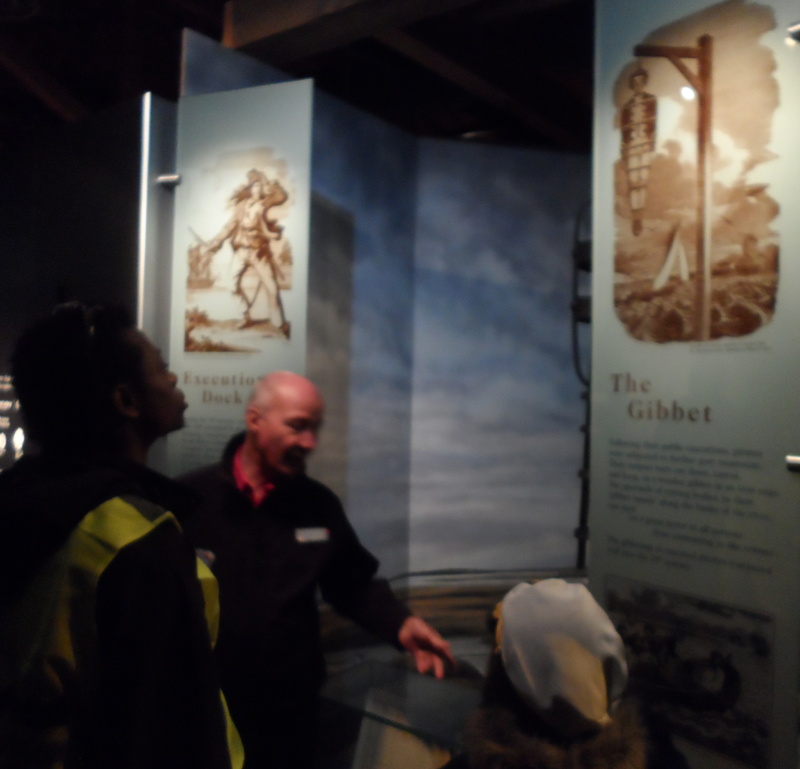 this referred to the practice of boys who swam out to the gibbet. 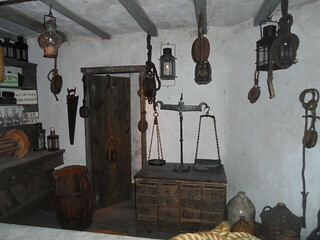 Hanging on with one hand they would take a stick and beat or rattle the metal cage holding the decomposing body until the bones dropped out. 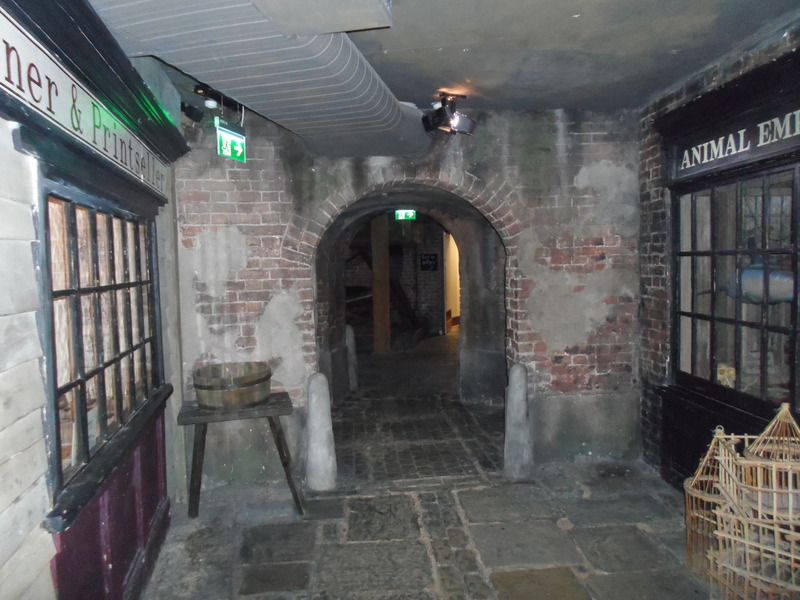 This macabre practice of gibbeting was unsuccessful as a deterrent as the criminal was rarely a believer in an afterlife and what did he care what was done to his dead body? 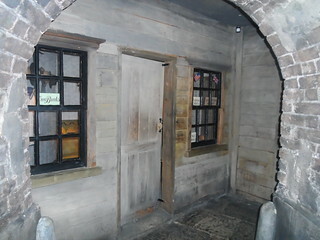 We spent a bit more time exploring this amazing museum. 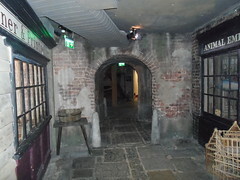 I would highly recommend the Docklands Museum as a place to visit. 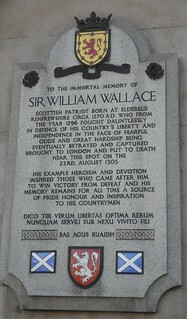 there is so much there and a fantastic reminder of the history of what made the city of London great. 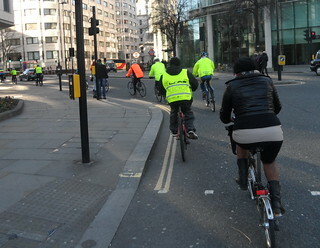 Even if you don’t cycle, Canary Wharf Underground Station is just around the corner. 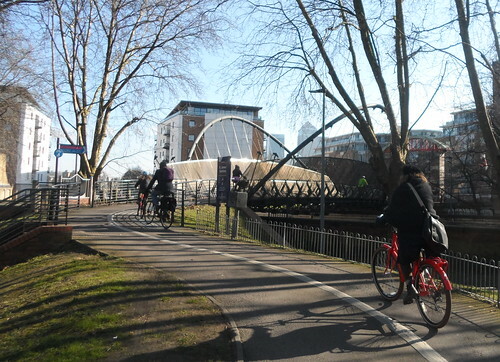 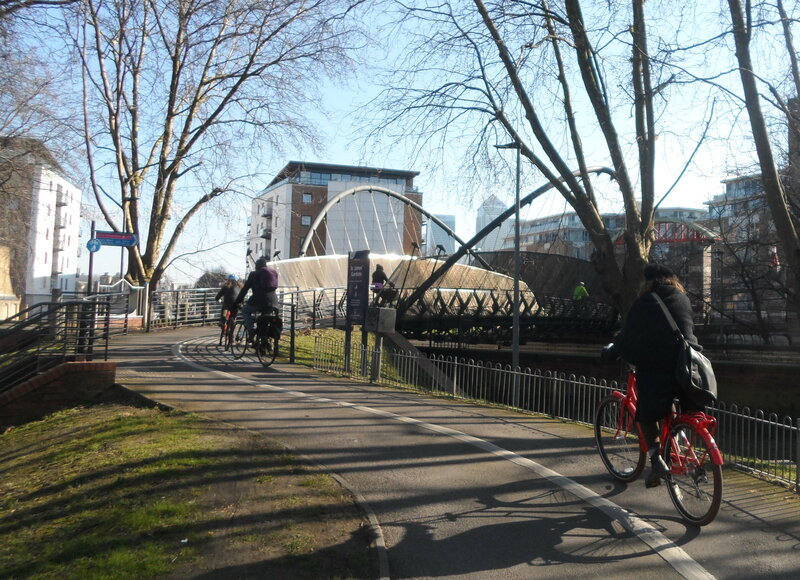 Heading back, instead of turning north and using CS3, we continued along the more picturesque riverside path. 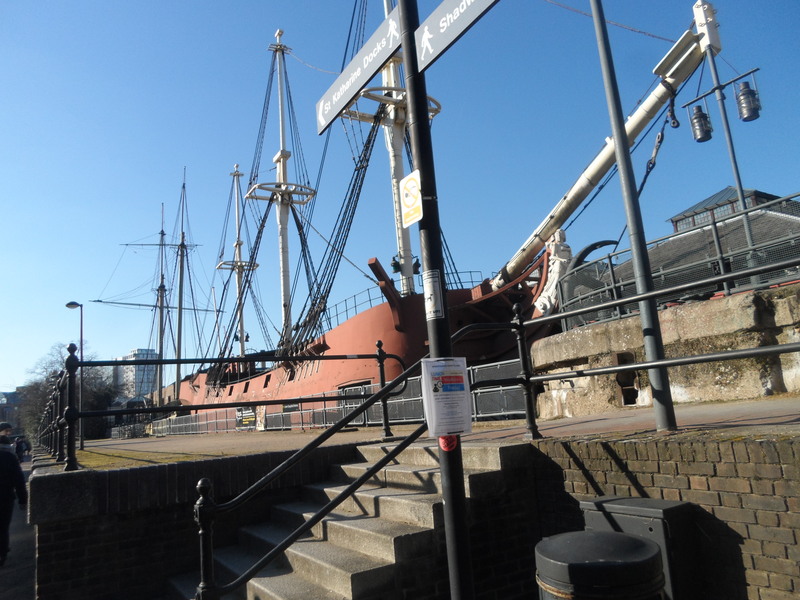 After passing the Rotherhithe Tunnel Shaft we rounded Shadwell Basin, crossed Wapping Woods and into Tobacco Dock and the Ornamental Canal, passing examples of sailing ships. 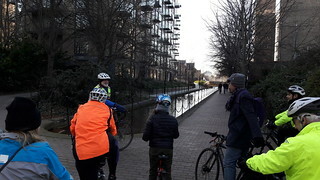 Rounding Hermitage Basin we turned north away from the river and retraced our route along Royal Mint Street and back on the CS3 in Upper Thames Street. Here Steven and family decided they would get the train home from the nearest station. 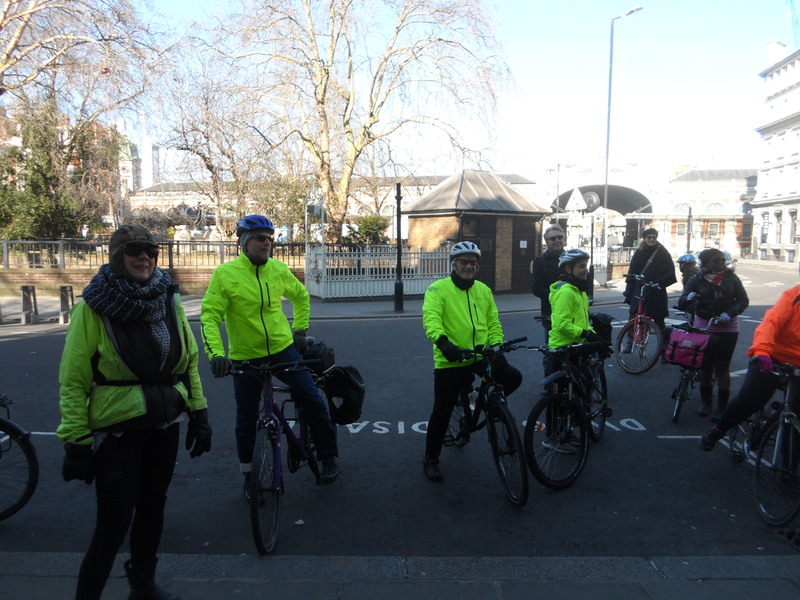 The rest of us took a slightly different route in the city when we turned west on Watling Street. He we encountered The Cordwainer’s Statue. Cordwainer was another name for Coblers. 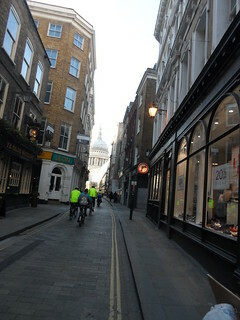 This part of the City of London is in the Cordwainer Ward. 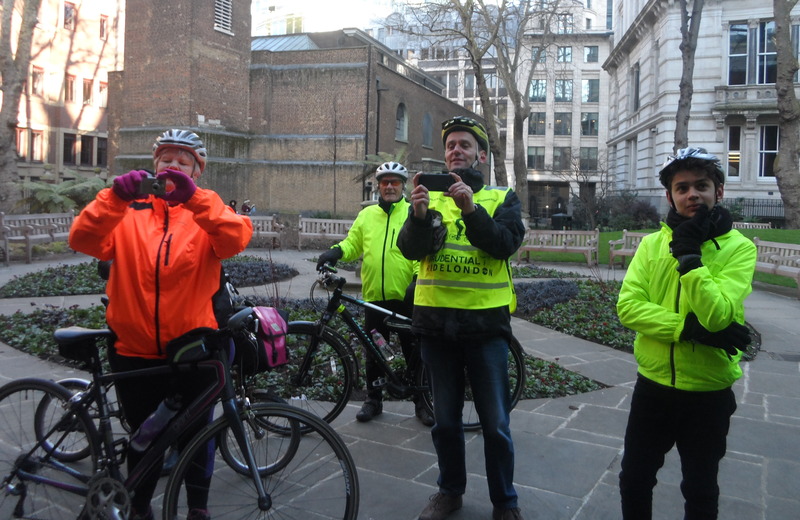 We continued west and then north on New Change to go past St Paul’s Cathedral and along Newgate Street, site of the infamous Newgate Prison. 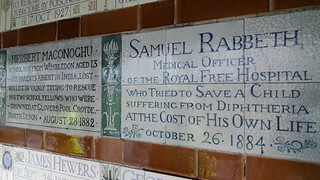 Just off King Edward Street, behind St Botolph-without-Aldersgate Church we were brought to the Postman’s Park. 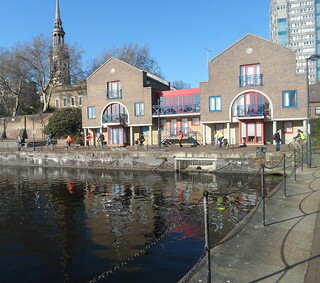 This was the site of the former headquarters of the General Post Office. 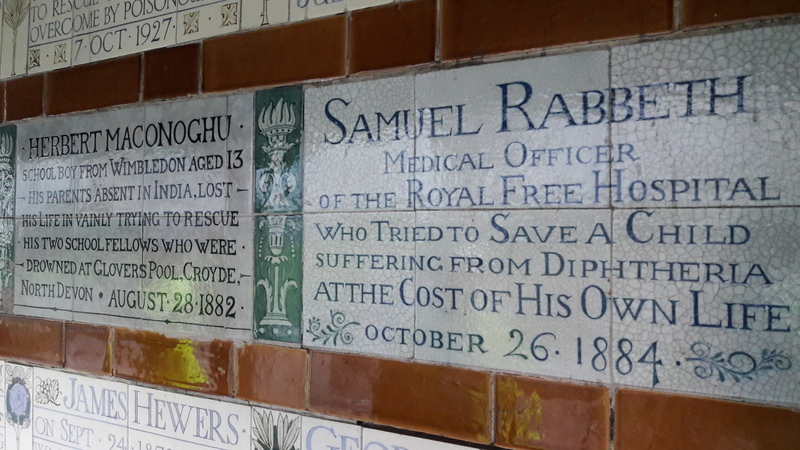 The park became the location for George Frederic Watts’s Memorial to Heroic Self Sacrifice, a memorial to ordinary people who died while saving the lives of others and who might otherwise be forgotten. 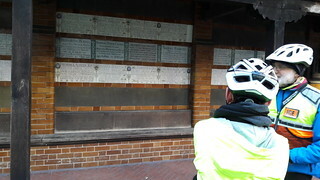 Reading the plaques on the wall was both inspiring and poignant. 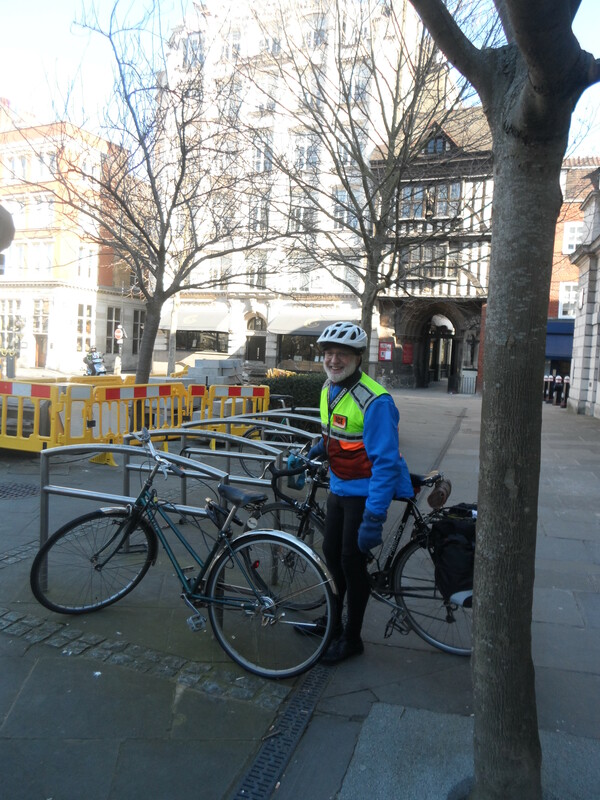 The route back to St Pancras was similar with minor alterations for convenience and we arrived back at the meeting place in good time. 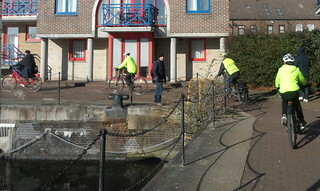 Morten, Oliver and I also made it back to Sidings in good spirits after a very enjoyable day of cycling and history. 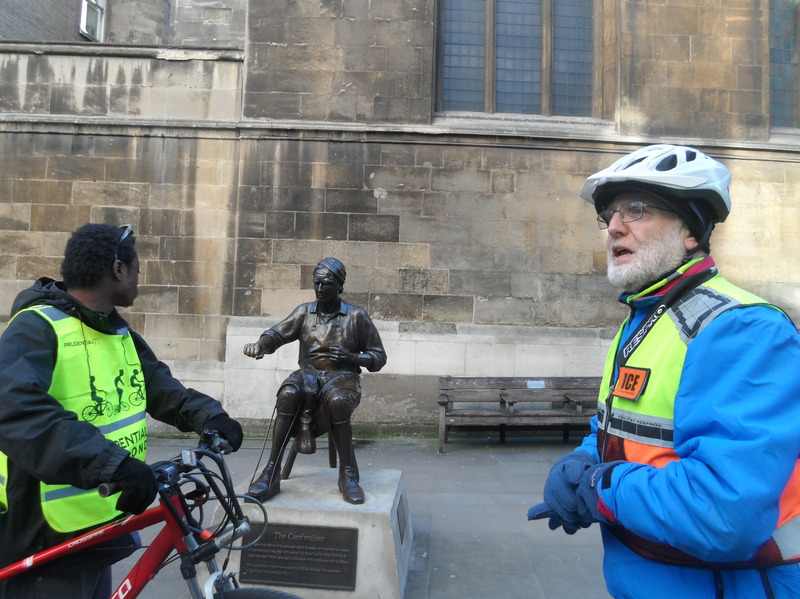 Thank you so much, Charles, for leading the ride and for your informative historical asides.